a) Shall we consider only empires or also kingdoms and republics? The longest-lived form of government ever is the Republic of Venice, which lasted for exactly 1,100 years. But that was neither a kingdom nor strictly speaking an empire (although it could be considered a commercial empire). b) Do we count only uninterrupted forms of governments or can there be brief interludes or changes of government? The Kingdom of England has so far lasted for 936 years, but was interrupted by 11 years of republic under Cromwell between 1649 and 1660. Additionally the form of government changed from absolute to constitutional monarchy. c) Do we only look at the name of the empire or should the capital and original homeland be maintained through its history? The Roman Empire is often claimed to have lasted from 27 BCE to 1453 CE, but these were actually two entities that shared little in common. The original Roman Empire was based in Rome with Latin as its official language, while the Eastern Roman Empire was based in Constantinople and had Greek as its official language. Personally I consider them as distinct, though related empires. Additionally the Eastern Roman Empire was dissolved between 1204 and 1261 when it was replaced by the much smaller Latin Empire. Many would regard the Holy Roman Empire as the true successor of the Western Roman Empire, as it also included Rome and was to a large extent Latin-speaking among its ruling elite. d) How about counting uninterrupted states, which might have changed name or form of government? Rome is the obvious example, having started as a kingdom, evolved into a republic then an empire. In that sense the Roman state lasted for nearly 1,000 years without cultural or linguistic interruption. Using this logic the longest lasting empire ever is Japan, which has existed as an empire for over 2600 years if we count legendary emperors, and still 1743 years and counting if we start from the first historical emperor. Japan however changed many times forms of government (absolute monarchy, shogunate, constitutional monarchy) and moved its capital four times since the establishment of the first permanent capital in Nara in 710. I will make several ranking considering all these factors and various possible combinations. I will start with the longest lasting uninterrupted empires (only), which always maintained the same official language and managed to preserve its original homeland. The capital is allowed to have changed. I did not list unofficial commercial and colonial empires such as the Portuguese and the Spanish Empires, which never had an emperor (except under Charles V), or the British Empire, which only existed in name from 1876 to 1947. I also left out many so-called empires that were actually kingdoms (Armenia, Egypt, Francia, Chola, Kush, Pandyan, Satavahana, Silla, Srivijaya), and the Carthaginian Empire, which was a kingdom then a republic. To be called an empire, a state normally has to be multi-ethnic and include several conquered kingdoms. Emperor is basically a title that means king of kings. Japan is probably the only exception to this rule, unless we see it as the Yayoi people from Korea conquering the native Jomon people during the Iron Age. Japan is also unusual in that the actual starting date of the monarchy is unknown, lost in ancient mythological stories, as first emperors of Japan pre-date the use of writing in the country by many centuries. The first historically attested Japanese emperor was Nintoku, who reigned from 313 CE, but the list of legendary emperors goes back all the way to Emperor Jimmu, from 660 BCE, nearly a millennium earlier. If we taken these in consideration, then the Empire of Japan may have existed without interruption for over 2,675 years - unless the six years of American occupation after WWII count as an interruption, but it shouldn't really as the emperor remained in place the whole time. I have lumped the Habsburg Empire with the Austrian Empire and the Austro-Hungarian Empire since they were essentially the same empire ruled by the same monarchy with the same capital and court language. The Austrian Empire was only officially proclaimed in 1804 in response to the creation of the First French Empire by Napoleon. In 1867 it became the Austro-Hungarian Empire when the constitutional union with the Kingdom of Hungary was enacted, although it was a pure formality as the Habsburg monarch had held both titles for 350 years. It could be argued that the Holy Roman Empire and the Habsburg Empire were the same entity between 1526 and 1806 as they shared the same emperor. Yet the two remained officially distinct and had separate capitals and legislations, the Habsburg Empire being the hereditary land of the House of Habsburg, while the Holy Roman Empire always remained officially an electorate, even if the Habsburgs always managed to get elected as Holy Roman Emperors. Now let's list the longest continuous states, whatever their form of government (kingdom, empire, republic) or the ruling dynasty, as long as the country existed under the same name without interruption, remained independent, and was ruled by the same ethnico-cultural group all the time. China as a single state was frequently divided between major dynasties or ruled by non-Chinese dynasties (Yuan, Qing), which explains that only one ancient period qualifies for the list. The same applies to ancient Egypt, which does not even make the top 30. I did not include city-states, nor prehistoric cultures that do not truly qualify as states in the modern sense (e.g. the Minoans). I also left out Sumerian dynasties because of mythological kings who supposedly ruled for hundreds of years at a time and were frequently ruled by foreign dynasties. Relatively small and secluded countries suddenly appear in the ranking, inlcuding ancient Vietnam (Văn Lang), the Sunda Kingdom on the Indonesian island of Java, three historical states in Korea (Gojoseon, Korea and Baekje), the Anuradhapura Kingdom in Sri Lanka, the Kingdom of Amman in Jordan, the Sabaean Kingdom of Yemen, the three Scandinavian kingdoms, and the Kingdom of Scotland. A continuous state does not always keep the same form of government. The best example is France, which shifted from monarchy to republic and to empire no less than seven times between 1789 and 1871. France remained France throughout this period, but its people were ruled very differently under each form of government. This ranking will look at political stability. Only states in historical times (i.e. with written records) are taken into account, as its impossible to determine political stability otherwise. Monarchies that passed from absolute to constitutional, or monarchs that officially stopped ruling personally to the profit of a Prime Minister or warlord (e.g. the shogun in Japan) are counted as separate forms of governments. A change of status (e.g. upgrade from kingdom to empire, even with the same ruler) also counts as a new form of government. I didn't count the Holy Roman Empire as it comprised many independent kingdoms and duchies, but also because it was long ruled de facto by the Habsburg dynasty from Vienna or Prague. Likewise the Roman Empire was split many times, with rival empires set up within its borders (Gallic Empire, Palmyrene Empire) before being finally divided into a Western and an Eastern Empire. Interestingly, and somehow ironically considering the extremely turbulent political scene that these countries experienced in later centuries, both the Kingdom of France and the Roman Republic rank amongst the most politically stable forms of governments in history. 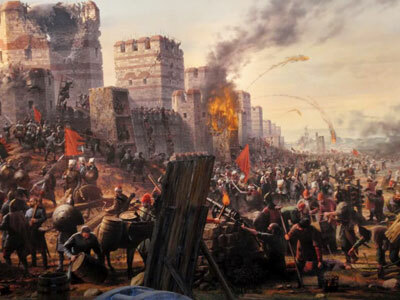 The Byzantine and Ottoman Empires also enabled together an amazingly long period of relative political stability in the Eastern Mediterranean, interrupted only during the late Middle Ages, but otherwise spanning from ancient Rome to the 20th century. If we consider that Anatolia was already under Roman rule for 450 years before the foundation of the Eastern Roman/Byzantine Empire, what is now Turkey has perhaps been the most politically stable region around the Meditteranean and the western half of Asia in the last 2000 years. Discuss this article on the Eupedia Forum.